Take advantage of Boston’s vibrant theater scene by finding your next home here in this beautiful neighborhood next to Boston Common and Chinatown. With multiple performance venues, the shows in this neighborhood range from Broadway musicals to opera, comedy shows to dance performances and more. 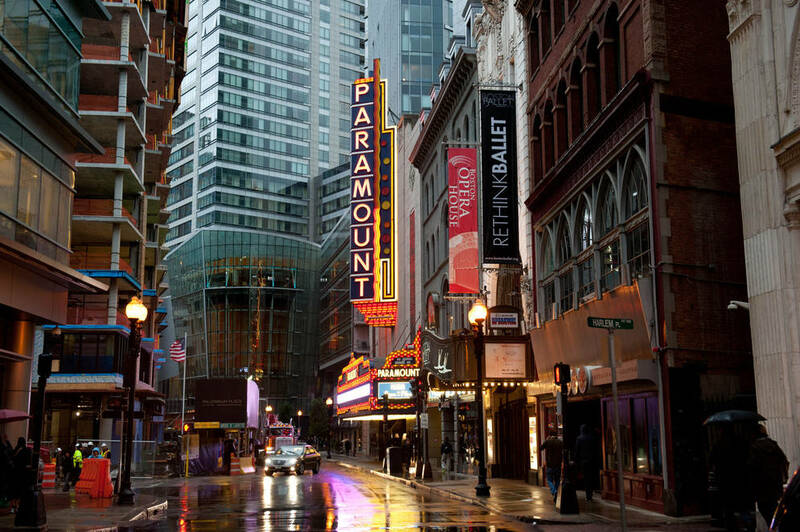 Browse current real estate and homes for sale in Boston's Theatre District, below. Listings on our site are added hourly by the MLS, so you'll always find the most current properties here. Log in or register to be automatically notified when new properties (matching your criteria) hit the market and to save your search for easy access to current listings. Located on the 16th floor of Millennium Tower, this designer home offers 1,366 square feet of luxury living with professionally-designed custom finishes throughout. Walls of windows in each room wash the space with natural sunlight and offer unparalleled views of the neighborhood below. The bedrooms boast upgraded hardwood herringbone floors, motorized Hunter Douglas shades, custom closets from the Container Store and en-suite baths; the master bath comes with a luxurious double vanity and large soaking tub, while the second bath comes with a glass-enclosed shower. The well-appointed kitchen has been outfitted by Poggenpohl and features with high-end appliances, stunning tiger wood cabinetry and a center island, perfect for entertaining. With access to Millennium Tower's unparalleled slate of amenities, as well as a valet parking space, this exclusive home leaves nothing to be desired. The unit is available furnished for an additional $25,000. MILLENNIUM TOWER BOSTON is the city's new full service, luxury residential building located in the heart of Downtown Boston. This spectacular 2 bedroom, 2 and 1/2 bathroom offers open concept living with 10-foot floor-to-ceiling glass window and valet parking. Upgraded finishings include Ivory Oak hardwood floor throughout, custom built-in closet and motorized window blinds throughout entire unit. Features include Poggenpohl kitchen and bath cabinetry, Sub-zero and Wolf appliances with gas cooking, wine cooler, Thermador oven and microwave! The tower's 5-star service offers 24-hour concierge, doorman, and access to an exclusive two-story Club with dramatic owner's lounge which offering private dining and bar, screening room, billiard parlor, library, private function room, outdoor terrace, children's playroom, 75-foot lap pool and the largest residential-only fitness facility in Boston.This dynamic location is walking distance to major attractions and all transportation points!